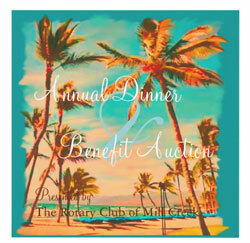 You don’t want to miss the Rotary Club of Mill Creek’s Annual Dinner and Benefit Auction on March 31st. This year's theme is Fiesta de Carnival in recognition of the fellow Rotary Clubs in Latin America. As a service organization, Rotary Clubs work against poverty, birth defects, disease, hunger, pollution, and illiteracy in Latin America as well as other parts of the world. Fishing, golf and archeology trips in Guatemala. A Mariners Spring Training getaway in Arizona. A paradise cruise on Puget Sound or a scenic flight to the San Juan Islands for dinner. Other dinners including your choice of a Mardi Gras Night or Oktoberfest celebration. Two days of silver salmon fishing on the Kalama River. To a case of 92 point rated 2008 Quilceda Creek Columbia Red Wine. The dinner will be held at the Mill Creek Country Club at 5:30 PM. For questions or reservations please email Bridget Barrington or call her at 206-841-4261.